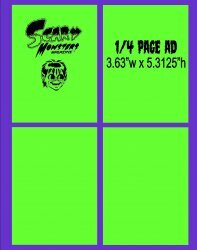 Promote your business, products, services or event in Scary Monsters, A Real Monster Magazine that is also family friendly! If you'd like to run an ad in a subsequent issue, or have a standing order for an ad, please contact us. If you'd like to place an ad, choose your desired ad size and Issue # at the drop-down menu above. To secure your ad space all ads must be reserved and paid in full by Deadline for art date. All Credit Card payments have a $5.00 credit card convenience fee added for online payments (the fee will show as a delivery charge on your receipt). To pay by money order or check for your ad placement, select the "Mailed Payment" option in the shopping cart. Scary Monsters is happy to provide graphic design services for your ad at reasonable rates, please call 951-600-7154 for price quotes and further information. Please Note: All ads are subject to approval and can be disapproved for any reason as we reserve the right of refusal for publication.